Advocacy - Wingspan Life Resources Wingspan Life Resources | Empowering Abilities. Nurturing Spirits. Caring for Life. Government funding (waivers) only cover a portion of Wingspan Life Resource’s expenses to care for our residents. That means we are increasingly reliant on individual gifts to fill funding gaps to sustain our programs, provide the highest quality of care and ensure that each house is a place to call home. That funding gap is one of the reasons Wingspan Life Resources is allied with other groups that advocate for people with disabilities. 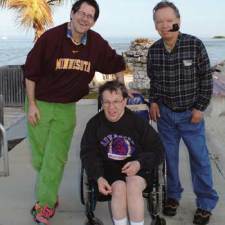 One of the leading associations in Minnesota advocating for persons with disabilities is ARRM, a nonprofit association dedicated to leading the advancement of community-based services that support people living with disabilities. Founded in 1970, ARRM continues to lead positive industry reforms that support Minnesotans with disabilities. According to ARRM, there are more than 6,500 Minnesotans with disabilities who are on waiting lists to move into residential care facilities. When these facilities aren’t available, nursing homes, living at home without adequate care or, in a worst case scenario, homelessness are the available options. The situation isn’t likely to improve due to changing demographics and the rising cost of medical care. At the same time, reduced waiver (payment) rates coupled with antiquated and duplicative regulations diminish the resources available to care for our most vulnerable citizens. Nonprofit disability rights organization run by and for people with developmental disabilities. Each year it holds the Minnesota Self-Advocacy Conference. Provides information for people with developmental disabilities and their families, connecting them with resources, and standing with them when they need an advocate.